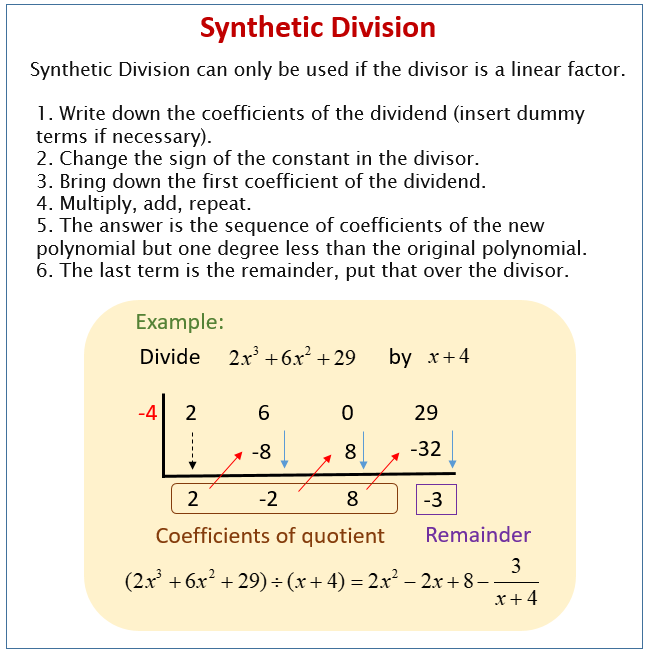 Examples, solutions, videos, worksheets, and activities to help Algebra students learn about dividing polynomials using synthetic division. When can you use synthetic division? You can only use synthetic division to divide polynomials when the divisor is a linear expression with a leading coefficient of 1. 1. Write down the coefficients of the dividend (insert dummy terms if necessary). 2. Change the sign of the constant in the divisor. 3. Bring down the first coefficient of the dividend. 5. The answer is the sequence of coefficients of the new polynomial but one degree less than the original polynomial. 6. The last term is the remainder, put that over the divisor. The following diagram gives an example how to divide polynomials using synthetic division. Scroll down the page for more examples and solutions.